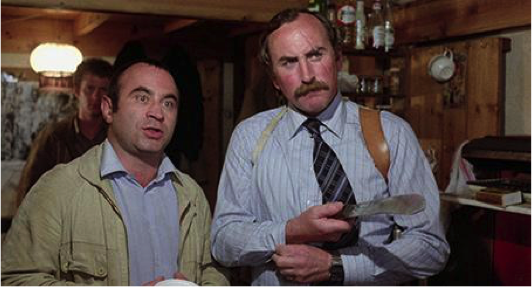 The Long Good Friday was always more than just a gangster film. The story may involve a disastrous battle between London gangland and the IRA , but the film itself is a time capsule of a 1970s London that only Londoners knew. There aren’t any cockatoo-haired punks or dolly birds in this city; no jolly red buses or people dancing down Carnaby Street. This London is tired, grubby, still bearing the scars of the Blitz, and ripe for exploitation. First, a little bit of history (it won’t take long). The London docks were the engine of the British Empire. For nearly 200 years ships brought goods to London from all over the world. The docks provided work and homes for thousand, and fortunes for some. Then trading companies found cheaper ways to transport their wares in huge container ships that couldn’t safely navigate the Thames past Tilbury and that was it for the London docks. Businesses moved or closed down and the enormous 19th century pools, dry docks, canals and cranes fell silent and empty. Harold Shand (Bob Hoskins) is an old-school East End gangster (“the boy from Stepney”) who controls a particularly large patch that includes a big chunk of the Isle of Dogs. He’s “a businessman with a sense of history”, and he wants to build offices, luxury flats and shopping malls where the docks used to be. His patter talks about London becoming the capital city of Europe, of preserving the past while looking forward to the future, but Shand’s idea of the future is skewed by his idea of the past. The film’s locations (not particularly the bits that get blown up, the other bits) speak volumes of Shand’s London. He lives on a yacht in St Katharine’s Dock, in the area that had already been developed into luxury flats and a marina by the late 1970s. The dock is quiet, almost deserted. The yacht is all polished wood and overstuffed cream upholstery; with tasteful prints and interesting brass objects that look vaguely nautical on the tables. 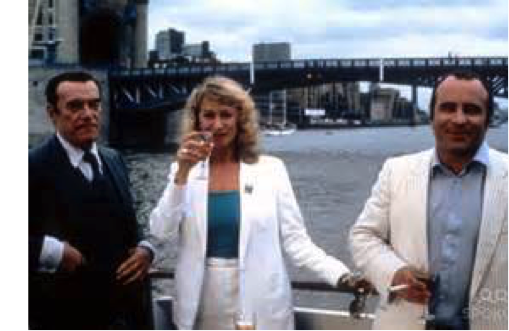 Shand roams the boat like a barely tamed bull among the sailing knick knacks, gladhanding investors, issuing orders to his henchmen, drinking cocktails with his sophisticated girlfriend, Victoria (Helen Mirren). Shand and Victoria’s world is smooth, hard and highly polished. People exist to serve their purpose, whether they are waiters, henchmen or the corrupt councillors and CID officers on Shand’s payroll. The film’s forays outside of this world offer a contrasting noisy warmth to the refined squillionaire’s ghetto of boat, casino and restaurants. Belfast pubs are warm and friendly (well, most of them are, anyway). The IRA farmhouse is suitably grim. The swimming pool where Shand’s lieutenant is murdered looks like a prison, with its high windows and cold light. But the most telling example of Shand’s skewed version of history is when he pays a visit to Errol the Ponce (Paul Barber) in Brixton, then what estate agents like to call a “vibrant” area (code for “here be black people”). Errol’s scruffy Victorian street is lively, with kids dodging between rusty parked cars. Shand only sees a slum where “decent families” once lived and mutters “people deserve better than this” as he drives away, having mutilated Errol in his scruffy kitchen and refused to give the local tiny toughs (led by a very tiny Dexter Fletcher) any money for looking after his car. But Shand respects the past, as long as it can work for him. He has a pub, a single Victorian building in the middle of a building site. The pub has been rescued from oblivion and restored to a high class theme park version of a ‘traditional’ pub that has “real old London character”. Except that pubs were the heart of the community and there is no community for this pub to serve, except for Harold and his mates. And I think this is where the film implies that Shand is damned. It’s nothing to do with Shand’s crossing and double-crossing of a group of even more amoral murdering bastards than his own crew, it’s in his lack of respect for the community that he has left behind. Shand has cut himself adrift from a society that he sees as dying and degenerate, but has nothing to replace it. 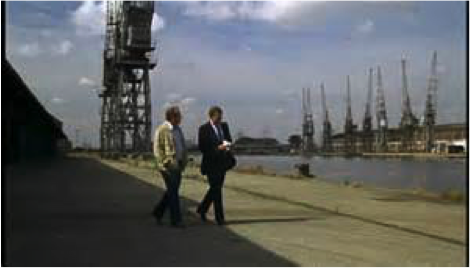 Yet Shand’s future is an uncannily prescient depiction of what actually happened to the docks, and what is happening to London as we are gradually turned into a giant theme park for the super rich. Reblogged this on At Home with the Slades.